This excerpt from Harvard’s first code of laws written in the mid 1600s describes the one and only parameter of admittance to the country’s first established college—be able to read from and speak to these topics and you’re in. With the barriers to knowledge for early American immigrants decidingly keeping an influx of applicants from overpopulating the school, this one simple, yet unwavering tenet kept everything in check for Harvard. Fast forward to today, and you’ll find that the acceptance of students to the more than 5,300 higher education institutions has become comparably lenient. However, with 67% of high school students going on to study higher education today, some measures have been put forth in recent times to keep from further saturating our already-full college campuses. Grade credentials, test scores, and extracurricular activities are just a few of the ways colleges keep overpopulation at bay. These arduous requirements that call for hard work and dedication from the applicant are not the final test, though. Poor application design and confusing processes plague the journey for prospective students. It’s the job of the schools to ensure that applicants have a stress-free experience while submitting an application. Her are just a few things to consider when evaluating your application process. The thought of sitting down in front of a computer and pulling up a college application will probably strike feelings of dread into anyone who has endured the process. Tack onto that the possibility of undergoing applications for financial aid and housing, and you are already about to throw your hands up in defeat. Not to mention that most applicants apply to several schools in their search for the right fit. The 2017 College Admissions Report found that nearly half of all students apply for five or more schools, and that 16% apply for more than 10 schools. And when you consider that every school has a different application portal that is likely slow, out-of-date, and hard to navigate, that puts unnecessary burden on future students. As a result, some applicants quit their submission before finishing. And, after all, at the end of the day, higher education institutions are in the business of enrolling students. Sometimes to extreme ends—recent reports have found that some schools are fabricating enrollment numbers with incomplete applications. It’s apparent that college institutions are desperate to market their growing populations to meet their bottom line. Schools are desperate to bolster their numbers, and students are eager to be admitted into their school of choice. The easiest avenue to common ground in this dilemma is to rethink the application process. It’s important to remember: merit is not being compromised. It’s a common tactic for schools to use long and deliberately confusing application processes to weed out students playing the game of “more applications equals higher chance of success”. While schools ideally want to enroll the best and the brightest, the application process should not be a deterrent. There have been attempts in recent decades to alleviate the hardships of the college application process. The most prominent example of this would be the Common Application. The Common Application is utilized by more than 700 colleges and universities worldwide and affords students a one-size-fits-all application for those schools. Unfortunately, the Common Application doesn’t come without its own set of faults. These include high-traffic times, redundant steps, and hidden information that make the going frustrating for applicants. Not to mention that unless an applicant is applying to one of the small fraction of schools that support the Common Application, this is not an option for them. The students of today are creatures of simplicity, speed, and convenience. Sure, the volume at which they apply to schools is perhaps a bit excessive, but with the number of students attending college these days, it’s one of the few ways to cut through the competition. There should be a prominent link directly to admissions from the institution’s homepage, and the link should be in the top half of the page. Consistency within the website is important. Application instructions should be simple and easy to follow. Offering the ability to pay online is more convenient and can save money. Students expect to be able to apply online; however, the application should be easily downloadable or printable. It should be easy to find any information applicants might be looking for. While it is important to make the application design as simple as possible so that applicants do not fail to complete the application, it is also important to allow applicants to save their application so that they can return to it later in case there are any hang‐ups. It should be easy for applicants to contact admissions, by mail, phone, email, and online. The last point above can be answered in its entirety with one simple solution: live chat. 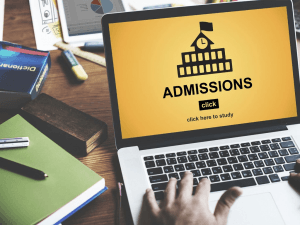 Higher education’s utilization of live chat functionality is certainly nothing new, but it’s the ultimate tool to help alleviate some of the pressure of the application process for students. It helps you put student engagement first. Reduce the chance of site abandonment: When a potential applicant visits your site, they are likely to become overwhelmed with all the information thrown at them. An automated live chat pop up asking if the visitor has any questions just might be the difference between landing an applicant and losing them to information overload. Helps build the brand: With live chat, you can quickly and easily articulate messaging and core values to visitors. This can aid in building trust for the student, help them feel engaged and heard, and increases your chance of pulling in an applicant. Cut down on call volume: The application season is not only a stressful situation for students. School faculty are working double time to deal with any issues to make the pressure-filled process run as smoothly as possible. With live chat at the front line, you can deter inquiries that come in over the phone or through email, freeing faculty up to focus on the bigger picture. Attending college has never been more easily accessible for more young adults than it is now. But the prospect of seeing a college application through to completion is a daunting undertaking. However, with a greater emphasis on a streamlined application process, higher education could see more enrollment and less headache at the beginning of every year.